Windsor, Ontario, Mar 19, 2008 - Dodge announced pricing today for the modern interpretation of the ultimate muscle coupe. The limited-volume 2008 Dodge Challenger SRT8Â® will have a Manufacturerâ€™s Suggested Retail Price (MSRP) of $44,995 (which excludes $1300 destination), and offer modern features such as 20â€� SRT Design wheels, high-performance suspension, dual-exhaust, and high-intensity discharge headlamps. Powered by the SRT 6.1 litre, 425-hp HEMIÂ® engine, the new Challenger will be one of the top â€œBang for the Buckâ€� products on the market, and Chrysler Canadaâ€™s best value in its SRT8 lineup. Later this year, four 2009 Dodge Challenger models will be offered in Canada: Dodge Challenger SE, Dodge Challenger SXT, Dodge Challenger R/T and Dodge Challenger SRT8. Pricing for the complete all-new Dodge Challenger lineup will be announced at a later date. For the 2008 Model Year only, Canadian automotive enthusiasts will have the chance to own the Limited-Edition Dodge Challenger SRT8 500. 2008 Challenger SRT8 500 models will be available in Black, Silver and HEMI Orange. All will feature a special 500 badge in front grille, 500 badge in the instrument panel, and all customers will receive a unique Certificate of Authenticity. The Challenger SRT8 500 will be powered by a 6.1-liter HEMI V-8 engine mated to a five speed automatic transmission with AutoStick that boasts 425 horsepower and 420 lb.-ft. of torque. The 2008 Challenger SRT8 500 will also include a wide range of high tech equipment such as dual â€œcarbon-fiberâ€� hood stripes, harkening back to the original Dodge Challenger, AM/FM 6 disc DVD MP3 radio, 13 speakers Kicker SRT High Performance Audio, UConnectÂ® Hands Free Communication, Security Alarm and Rearview auto dim mirror with microphone. Interior 2008 Dodge Challenger SRT8 500 highlights include race-inspired leather seats with added bolstering and an exclusive orange accent stripe, exclusive stitched accents on the seats and steering wheel, four-bomb gauges with tachometer and speedometer in the center, and an SRT-exclusive Reconfigurable Display (RCD) with Performances Pages that provide drivers instant feedback on 0â€“100 km/h time, 100â€“0 km/h braking, g-forces and Â¼-mile time. Four 2009 Dodge Challenger models will be offered in Canada: Dodge Challenger SE, Dodge Challenger SXT, Dodge Challenger R/T and Dodge Challenger SRT8. The Dodge Challenger SXT will include standard 18â€� aluminum wheels, Anti-lock 4-wheel disc brakes, all-speed traction control, leather wrapped steering wheel, power 8-way driver seat, security alarm and fog lamps. The Dodge Challenger R/T features the new-generation 5.7-liter HEMI V-8 engine with five-speed automatic transmission that produces 370 horsepower (276 kW) and 398 lb.-ft. of torque (540 Nâ€¢m). For 2009, the HEMI engine is upgraded to get an estimated five percent improvement in fuel economy as well as an increase of 30 horsepower (8 per cent) and 8 lb.-ft. improved torque over a greater range of engine speeds. The Dodge Challenger R/T also offers a precision shift six-speed manual transmission combined with the new-generation HEMI-powered engine that will produce 375 horsepower (280 kW) and 404 lb.-ft. of torque (548 Nâ€¢m) when running on premium fuel. The 2009 Dodge Challenger SRT8 features an SRT-exclusive 6.1-liter HEMI V-8 engine with five-speed automatic transmission with Auto Stick that generates a blistering 425 horsepower (317 kW) and 420 lb.-ft. of torque (310 Nâ€¢m). The vehicle can go from zero to 60 mph in less than five seconds. The Dodge Challenger SRT8 also offers a precision shift six-speed manual transmission. The Dodge Challenger design team strived to stay true to the concept revealed at the 2006 North American International Auto Show, while drawing upon elements from the original Challenger. On the exterior, the long, raised hood with scoops and recessed grille with round dual-headlamps are reminiscent of the original Dodge Challenger. The bold A-line, or character line, that runs from stem to stern gives the all-new 2009 Dodge Challenger an instantly recognizable muscle car profile. Retro dual rectangular exhaust outlets complete the look from the rear. On the interior, the trapezoidal theme of the door-panel cove and gauge cluster, dark headliner and slanted shifter console are inspired by the original Dodge Challenger. The modern interpretation of the Dodge Challenger offers exceptional rear seating for a two-door coupe, achieving best-in-class rear head (37.4 inches) and leg (32.6 inches) room compared to the competition. Coupled with best- in-class cargo space (16.2 cu. ft.) â€” equal to the Dodge Charger â€” the all-new 2009 Dodge Challenger offers added comfort and functionality. I put down my deposit for an 2009 SRT because I want the 6-speed. The only dam problem was that it would not be offered in Hemi Orange but then after seeing a Hemi-Orange Charger, I will opt for the Black Brillinat Pearl because it will be faster! 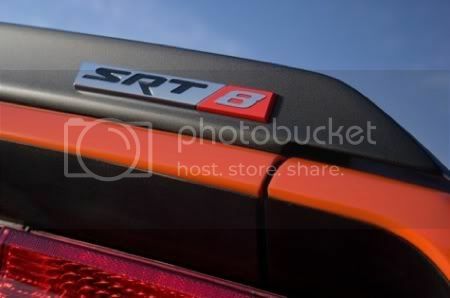 Don't know if you've been to your local dealer - but Hemi-Orange is now available for the 09 Challenger SRT8. I just ordered mine - the guy taking my order said that color code opened up in early May. So - I got Option PLC for Hemi Orange Pearl Coat. I visit my dealer today & no you can not order a 2009 Challenger now.Dealer did not get the Ok from Chrysler to order any.If you know how to order one ,Please give me any info & I will tell my largest Dodge dealer in Quebec how to do so.